Salamander Trust’s Alice Welbourn and Associate Nell Osborne are delighted to be able to attend the 20th International AIDS Conference in Melbourne. Please click here or scroll down this page to view the activities in which we are involved. **Salamander Trust is deeply shocked and saddened to learn of the loss of flight no MH 217, on which several delegates to the AIDS conference were also travelling. They were all working tirelessly to ease the ongoing tragedies and losses of many many people with AIDS and their families around the world. Our hearts and prayers go out to the families and friends of them all. Click here to read Editions One and Two and Three of Mujeres Adelante 2014, produced by our sister organisation AIDS Legal Network. 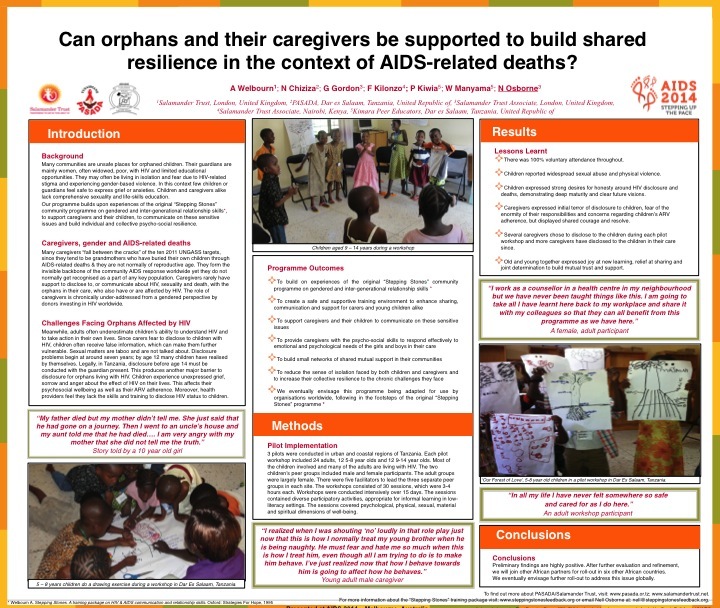 To read and view more about how “Stepping Stones” featured in our and others’ presentations at AIDS 2014, (in Malawi and South Africa) please click here.